Early each morning my husband and I would walk the three blocks from our hotel down to Kalakaua Avenue, which fronts Waikiki Beach in Honolulu (on the island of Oahu). Buying big cups of hot, dark Kona coffee and freshly baked scones, we sat on the benches lining the beach and watched the early morning surfers with the back drop of Diamond Head completing the perfect picture of paradise. The beach changed as the sun continued to rise and the weather became hotter. More and more people arrived, the vendors who rented surfboards and boogie boards and even beach chairs appeared to set up their outdoor stands and the surfing competitions, being held that week, would begin. Waikiki is commercial - full of t-shirt and souvenir shops - but is also beautiful, lively and wonderful. For $10 an hour my husband and teenage son rented surfboards and attempted to ride the waves. 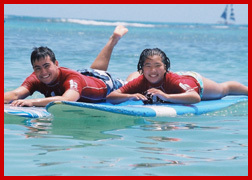 For $5 an hour, my daughter and I rented boogie boards and let the waves carry us to shore in the warm waters. When we were hungry, we just walked a few steps and were able to choose among many different cuisines including Japanese, Chinese, Thai and, my favorite, Korean barbecue. Indeed, there seemed to me to be as many Korean barbecue restaurants as pizza places - a nice change from the small midwestern town where we live. During most of our stay on Oahu we either hoofed it, used public transportation or signed up with one of the many tour guide agencies that abound everywhere. But on the day we decided to go to the North Shore on the opposite side of the island we rented a car. The small enclaves of beach towns and easily accessible public areas that line the North Shore offer a vast contrast to the commercial Waikiki and instead seem like a remnant from the 1960s. It's the kind of place filled with surf shops and small trailers advertising freshly cooked shrimp served with or without garlic. Here, plastic tables and chairs beneath an awning serve as an outdoor patio and cleaning facilities (for the shrimp, which need to be peeled are messy) consist of an outdoor sink and faucet. Off Kamehameha Highway on the North Shore in the Waimea area, we made a split second decision to stop at Shark's Cove at Kalalua Point. Renting snorkeling equipment for $5 for two hours at the shop across the street, we walked down the cliff to the water (entry to the park is free). Part of what makes this a prime snorkeling area are the rocks which attract marine life. The jagged rocks are also a detriment, making access difficult. But traversing the slippery lava rocks was worth it because the waters are very clear and filled with sea urchins, starfish and other sea creatures. My teenage son who likes a lot of action loved climbing to the top of one of the small rock islands that fill the bay. Here other teenagers, and some adults-with an urge to cannonball off a cliff, were doing just that. We didn't rent a car the day my daughter and I traveled to Hanauma Bay, which is east of Waikiki. For $10 each, we were able to jump aboard one of the many vans that take tourists all over the island. The price included a round trip to the bay and the use of snorkel equipment. Our driver warned us that there might be a wait of almost an hour to get through the park's entrance but we lucked out and were only the fourth in line - with crowds arriving a bit later in the day. Next came a longer wait for a 15 minute mandatory movie about Hawaii's environment. It's a nice idea but a little irritating when you want to get to the beach instead. The views from the bluff above the horseshoe shaped Hanauma Bay, surrounded by high cliffs covered with verdant and lush vegetation, are breathtaking, but it also means that it's a quite a steep walk down the hill to the bay itself. Coming up, for $1 you can ride the shuttle, which we did. Settled on the beach, I instantly regretted I hadn't packed a cooler as there are no refreshment stands. But a little thirst aside, the flat and calm waters of the bay are easily accessible - no sharp rocks - and within minutes, with our snorkel equipment on, we were submerged in a world of brightly colored fish, many of whom seemed as interested in us as we were in them. ..... Jane Ammeson writes about travel, personalities and food and is a member of the Society of American Travel Writers. She writes frequently for Northwest Airline's World Traveler Magazine, Caribbean Travel & Life and the Chicago Tribune. She is also a food columnist for the Herald Palladium.